The Camero Room was located in the Blue Horizon. 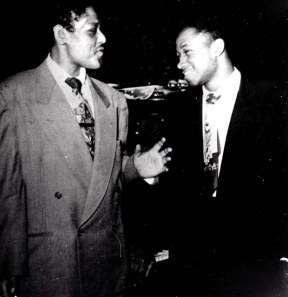 In July 1949, the Fats Navarro Quintet performed there. Philly native and NEA Jazz Master Benny Golson said it was likely the first meeting between Navarro and Clifford Brown. Benny Golson describes what was probably the first meeting between Clifford Brown and Fats Navarro. One of the Philadelphia clubs “had local talent there, Clifford Brown, an alto player and a rhythm section – and Fats was a little late getting in. Clifford was playing as he entered, and Fats sort of realized halfway between the door and the stage what was going on – you could see him slow his pace just a little and sort of look up to see where all this playing was coming from. He proceeded to take his trumpet out; he got up there, and they called another tune off and began to play. Being the star, as it were, at the time, Fats played the first solo, and then Clifford began to play. Fats held his horn in his arms the way trumpet players do, and sort of stepped back – not in awe, but sort of like in respect. And I’ll tell you, Clifford was really holding his own. In fact, as kind and meek as he was, when he picked his horn up and the tempo really went up, he became almost like a vicious person, you know – darting and dodging and badgering and manhandling – yet it was all very beautiful, very controlled and colored with emotion.